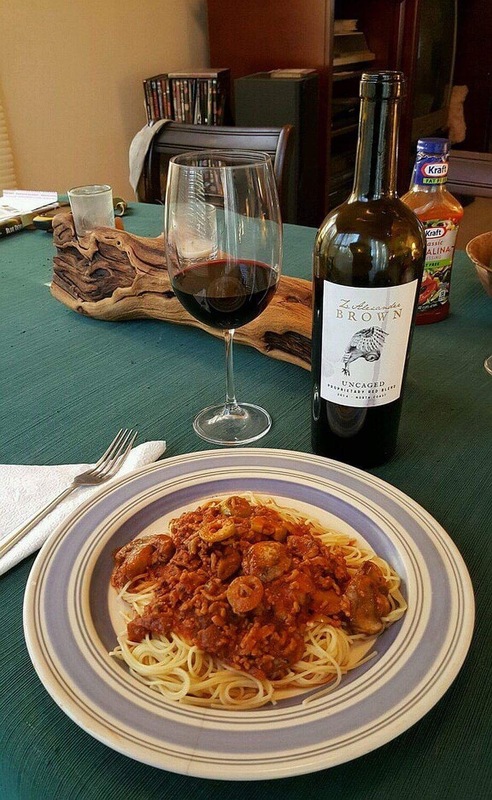 The spaghetti is kind of tentacly, the veal is good metaphor for dead babies, and the main character of the tale is a martini man. Note: that all measurements are approximate and can be adjusted to suit individual tastes. Pour olive oil into a large skillet (preferably cast iron) and heat at medium-high temperature. Once the oil is hot, dump in the ground veal and stir constantly with a spatula. Before the veal is quite brown, strain out the excess grease. Reduce the temperature to medium-low, and dump the mushrooms, onion, garlic, scorpion pepper sauce, salt, pepper, and all the spices into the skillet. As it simmers, pour in the vodka, vermouth, and olive juice. Let simmer for approximately 15 minutes, stirring frequently. After 15 minutes, pour in the diced tomatoes, tomato sauce, and green olives. Cover and simmer on low temperature for 30 to 40 minutes, stirring occasionally. During this time, cook the angel hair. I recommend seasoning the pasta separately with salt and pepper to taste before pouring the sauce over it. “Messages From a Dark Deity,” appears in RETURN OF THE OLD ONES from Dark Regions Press. Featuring all new stories of cosmic and Lovecraftian horror based pre, during and post the apocalypse by authors Jeffrey Thomas, Lucy A. Snyder, Tim Curran, Pete Rawlik, Sam Gafford, Christine Morgan, Cody Goodfellow and many more, Return of the Old Ones: Apocalyptic Lovecraftian Horror continues the Dark Regions Weird Fiction line with 19 original stories from some of the best authors in Lovecraftian horror and weird fiction today. Return of the Old Ones will only have one signed edition (deluxe slipcased hardcover) and will feature a similar stamp design to the popular Cthulhu head stamping featured on the World War Cthulhu hardcovers. It will be signed by all contributors and will feature the original color cover artwork by Vincent Chong as color end sheets. Stephen Mark Rainey is author of the novels Balak, The Lebo Coven, Dark Shadows: Dreams of the Dark (with Elizabeth Massie), The Nightmare Frontier, Blue Devil Island, and The Monarchs; over 100 published works of short fiction; five short-fiction collections; and several audio dramas for Big Finish Productions based on the ABC-TV series Dark Shadows, featuring members of the original TV series cast. For ten years, he edited the award-winning Deathrealm magazine and has edited anthologies for Chaosium, Arkham House, and Delirium Books. 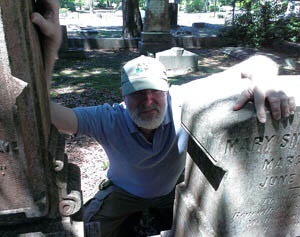 Mark is an avid geocacher, which oftentimes leads him to discover creepy places — and people — that wind up in his horror stories. He lives in Greensboro, NC with two precocious house cats, one of which owns a home decorating business.